The hands signify friendship, the crown loyalty, and the heart love. 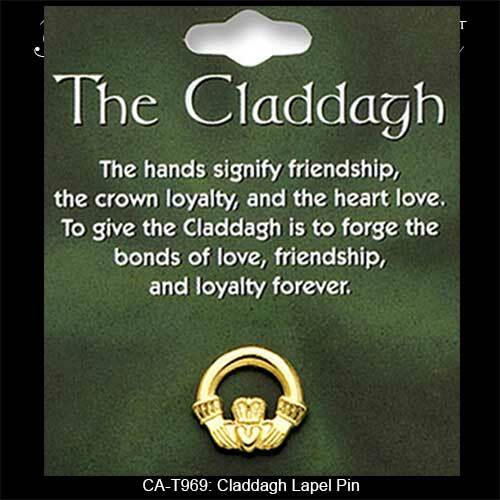 To give the Claddagh is to forge the bonds of love, friendship and loyalty forever. This Irish costume jewelry pin features a gold tone metal Claddagh symbol. The costume jewelry Claddagh pin measures 5/8" wide x 5/8" tall and it is complete with a push on butterfly back. This Irish costume jewelry is suitable as a tie pin and it is received with an Irish blessing along with a Claddagh history card, complements of The Irish Gift House.